Each spring, the Pew Research Center’s Internet & American Life Project conducts a survey designed to assess the state of broadband adoption by Americans and, particularly, to probe the attitudes and experiences of those who do not use broadband. Over the last decade, broadband adoption has gone from being the province of the elite to a mainstream behavior by the majority of Americans. This year’s Pew Internet broadband survey was conducted with that dramatically changed policy environment as backdrop. In addition to capturing data as we had in the past about the non-user cohort, we did some things this year that we had not done in the past, such as evaluating Americans’ attitudes about the “value” of a broadband connection for key activities. Further, we tried to gauge public sentiment on the key policy question: Should the government make the spread of affordable broadband a priority or not? 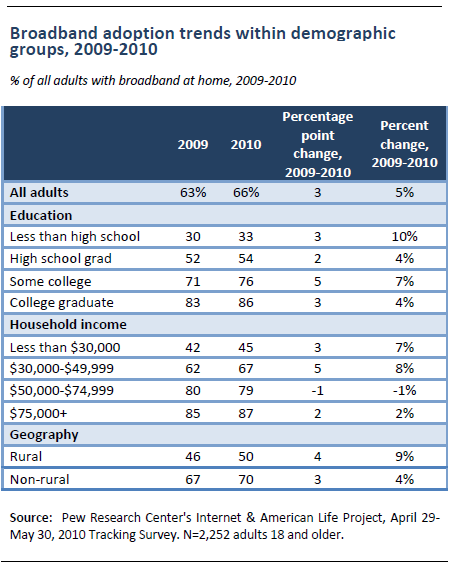 As of May 2010, two thirds (66%) of American adults have a high-speed broadband connection at home. 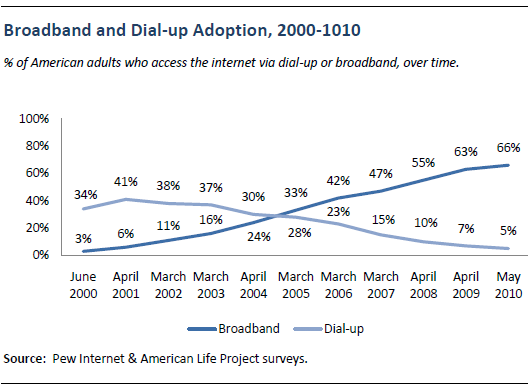 This is unchanged from our April 2009 finding that 63% of American adults had a home broadband connection.2 The remaining 34% of the adult population outside of home broadband users includes those who go online using a dial-up connection (5% of adults), those who do not go online from home (26%) and those who go online from home but are unsure what type of connection they have (3%). 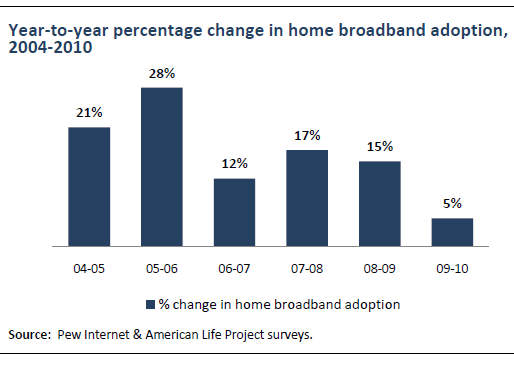 This three percentage point difference between our April 2009 and May 2010 surveys (a difference that is not statistically significant) translates into an overall year-to-year change in home broadband adoption of just 5%, the lowest year-to-year change in recent years. African-Americans are one of the few major demographic groups to experience notable year-to-year growth in home broadband adoption. 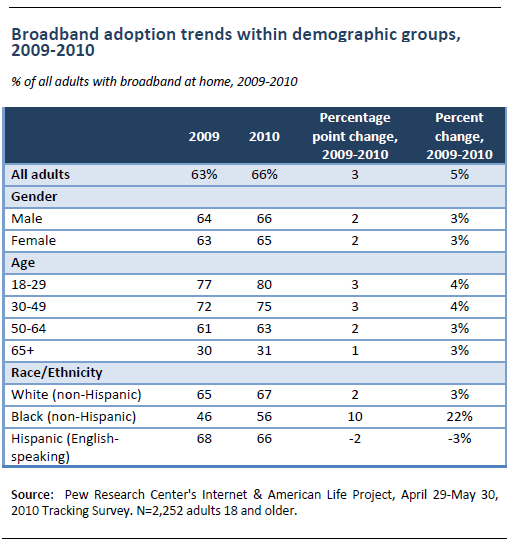 The percentage of African-Americans adults with a home broadband connection grew from 46% in April 2009 to 56% in May 2010,3 which works out to a 22% year-over-year increase. No other demographic group saw their overall broadband usage grow by more than ten percent on a year-over-year basis. Even with this increase, African-Americans continue to trail whites in their use of broadband technologies. However, the gap between whites and blacks has been cut approximately in half over the last year. In 2009, the gap between blacks and whites was 19 percentage points (65% vs. 46%); in 2010 that gap stands at 11 points (67% vs. 56%). In May 2008 we first asked respondents with home broadband service whether or not they paid extra for “premium” broadband service promising higher speeds. Our findings on this question have been fairly consistent over this time—at the moment, 51% of broadband subscribers subscribe to a basic service, one-third (36%) pay extra for a higher-speed premium service, and an additional one in ten (13%) are not sure whether they have a basic or premium service. Overall there is relatively little variation among broadband users on this question; the biggest differences are associated with household income. Broadband subscribers with an annual household income of $50,000 or more are evenly split between basic subscribers (46%) and premium subscribers (42%). By contrast, broadband users living in households earning less than $50,000 per year are much more likely to subscribe to a basic service than to a premium offering (59% of such households have a basic service, while 29% pay extra for a premium service). 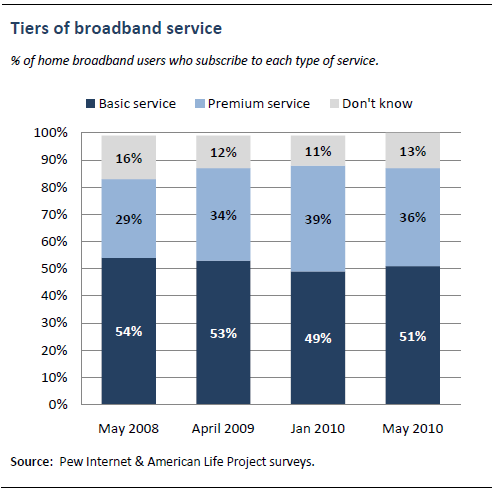 Additionally, parents are somewhat more likely than non-parents to subscribe to a premium broadband service (40% vs. 33%). Perhaps due to the proliferation of bundled services that incorporate internet, phone and television service, many home internet users are unsure of what they pay for their connection. When asked what they pay for internet access, one quarter of home users are unable to provide an answer. Among those who do provide an answer, the average home broadband user pays $41.18 per month for service. This figure is little changed from what we found in our spring 2009 survey, when the average home broadband user paid $39.00 per month. Basic broadband internet subscribers pay an average of $39.01 per month in 2010, while premium subscribers pay an average of $45.83. Each of these represents only a modest change from our 2009 survey findings. The average dialup user pays $29 per month for home service—this is also up only modestly from the average 2009 dialup bill of $26.60. One in five American adults (21%) do not use the internet or email from any location, and a majority of these non-users have little exposure to the online world. Some 16% of non-users live in a household where someone else uses the internet (even if they personally do not) and 22% used the internet or email in the past but no longer do so. Taken together, that means that one-third (34%) of non-internet users have some familiarity with the internet, either from past personal experience or from living in a household where someone else goes online. Since we first asked these questions in spring 2002, roughly one in five non-users have consistently answered “yes” to each of these questions. Not only are most non-users unfamiliar with the internet, they are not especially interested in getting online. Only one in ten non-users (10%) indicate that they would like to start using the internet or email in the future, a figure that is also largely unchanged from the first time we asked this question of non-users in 2002. Older non-users are especially likely say they are not interested in going online—just 5% of non-internet users ages 50 and older say that they would like to start using the internet or email. As we have found in previous surveys, roughly half (48%) of non-internet users cite issues of relevance when asked why they do not go online. One in five (21%) point to issues related to price while 18% cite usability issues and 6% point to access or availability as the main reason they do not go online. 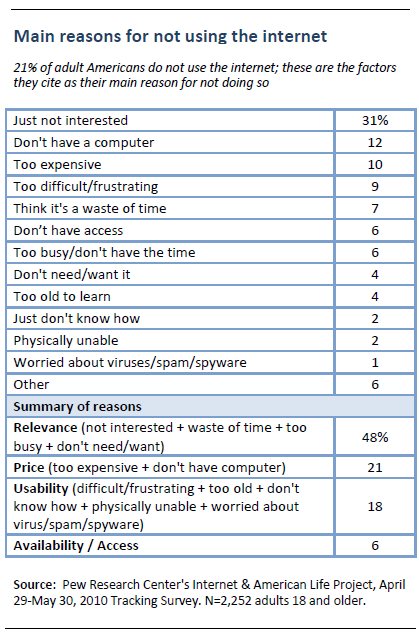 Not only are most non-users uninterested in getting online, many say that they do not know enough about computers or technology to use the internet on their own. 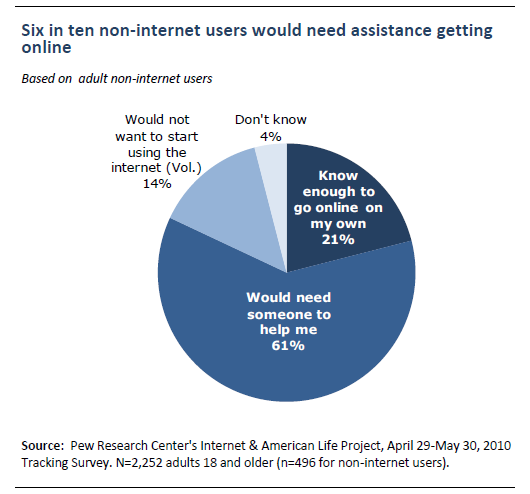 When asked if they know enough about computers and technology to start using the internet on their own, just one in five non-users (21%) say that they do while six in ten (61%) say that they would need someone to help them. An additional 14% volunteered that they would not want to start using the internet.